Wilmington North Carolina has been chosen as the site of yet another Navy ship commissioning. 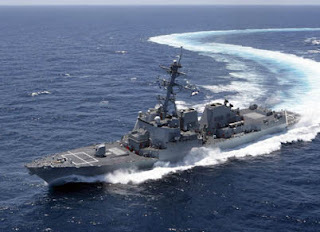 The USS Gravely, a guided missile destroyer will be commissioned at the North Carolina State Port in Wilmington on November 20th. The USS Gravely is scheduled to arrive in Wilmington on November 12th and will be involved in activities throughout the city all week. This will be the second ship commissioning ceremony in Wilmington, North Carolina since 2008. “Wilmington will be on center stage not only for our region but for our state and nation. As was the case two years ago when the USS North Carolina submarine was commissioned here, our area will once again be seen as a great supporter of our nation’s military.” Congressmen Mike McIntyre said in a press release. Mayor Bill Saffo told a group gathered at a Wednesday morning press conference that Wilmington will be “honored” to host its second commissioning. “This will also be a tremendous tourist boost for our community,” he said. “This is a huge honor. It speaks well for New Hanover County that we have the facilities to do it,” said Commissioning Chairwoman Louise McColl. The festivities surrounding the commissioning should produce a boon to the local economy, with more than 7,000 guests expected to attend the ceremony, McColl said. There have been many events prior to November to build excitement and awareness. The ship is named after Admiral Samuel Lee Gravely Jr., the first African-American admiral in the navy’s history. Alma Gravely is expected to attend the ceremony in honor of her late husband. Adm. Gravely’s service dates back to World War II, with action in Korea and Vietnam as well. He received numerous military decorations throughout his long career including the Legion of Merit, Bronze Star and Meritorious Service Medal. The USS Gravely will be home to 380 officers and enlisted men, according to a press release. The SSN 777 North Carolina submarine is home to about 96 staff. Our Wilmington North Carolina Bed and Breakfast is a close 6 minute drive to the North Carolina State Ports where the tours and Commissioning Ceremony will be taking place and a short stroll to the downtown riverfront. We have rooms available during the week-long festivities. This entry was posted in downtown riverfront, USS Gravely, wilmington nc bed and breakfast by Doug Erickson. Bookmark the permalink.